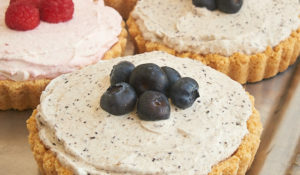 I realize that I just told you that I don’t often make cupcakes and here are more in the very next post. It’s really just coincidence. I happened upon this recipe by accident and was instantly intrigued. A cupcake that tastes like pecan pie? How could I not try them? I’ll admit that I was skeptical that these would take even remotely like pecan pie. But, all the comments were so positive that I figured there had to be something to them. Plus, the recipe seemed so easy that I decided it wouldn’t be much of a loss if they were no good. These are so simple to make. Basically, the five (just five!) 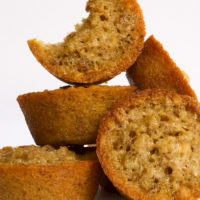 ingredients are all mixed together and then scooped or poured into muffin pans and baked. That’s it. Getting the batter doled out into the pans takes longer than it does to mix it up in the first place. Keep in mind that there is no leavening in the batter, so they won’t rise. 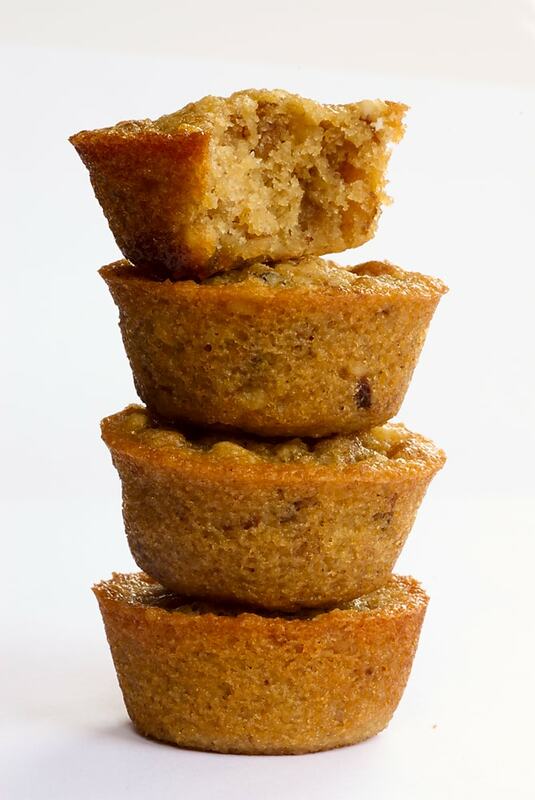 If your muffin pans are filled three-quarters full, that’s pretty much what size cupcake you’ll get in the end. While I made these in mini muffin pans, larger ones would work, too. Just remember that they might need to bake a bit longer. So, what about the taste? Do they actually taste like pecan pie? They really do! I was definitely surprised by that, but that really is the dominant flavor. These cupcakes are certainly plenty good on their own, but I couldn’t resist trying them with a bit of chocolate drizzled on top. Do I even need to tell you how good that was? Find more cupcake recipes in the Recipe Index. You only need 5 ingredients to make these simple, delicious Pecan Pie Cupcakes! Preheat oven to 350°F. Grease or line 24 cups of a mini muffin tin. Combine all ingredients and mix well. Fill each muffin cavity about 3/4 full. Bake for 18-20 minutes, or until the edges are browned and the centers are set. I made these at Christmas. They really do taste like pecan pie! My husband who is a huge pecan pie fan really liked them. I’m not a huge fan of pecan pie. but in cupcake form!? I may be swayed. The chocolate drizzle is helping change my mind for sure! I am Pecan Pie’s BIGGEST fan!! I will defnitely bookmark this one for the near future. P.S. I almost fainted when I saw them drizzled in chocolate, lol. Yum! 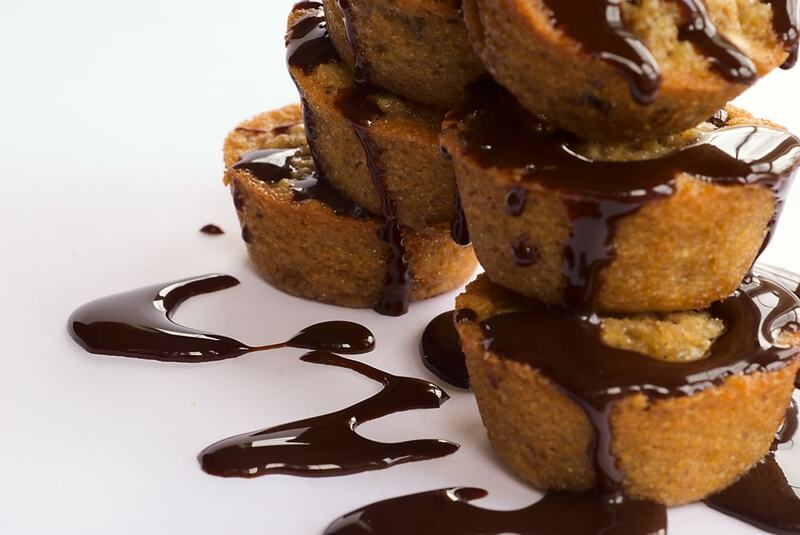 These looks so moist and with all that chocolate drizzled all over them… yum!!! I have had this recipe sitting in my file forever. Like you, I have been skeptical, because pecan pie is my favorite pie! But, I’ll definitely have to give these a try, soon! I love pecan pie with chocolate chips thrown in so these are up my alley. And only 5 ingredients, sound like I should try them for Easter. Yum! Cindy, I’m glad to hear from someone else who has made these. I still can’t believe how much they taste like pecan pie. Joy, I’m always amazed when someone doesn’t like pecan pie. I just love it! Maybe you could like the cupcake version! Marq, if you love pecan pie, these are definitely for you. Let me know what you think! Katie, they are indeed fabulous! Aran, they are quite moist. 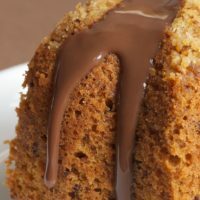 Of course, warm with that chocolate on top is just amazing! Amy, let me know how you like them! Megan, I’m sure these would be great for Easter. I hope you like them! I’m the only one in my family that likes (loves, really) pecan pie, so I hardly ever get to have it. I should make these and make them all jealous because I have cupcakes and they don’t, lol! Brilliant recipe! I haven’t seen anything similar before. 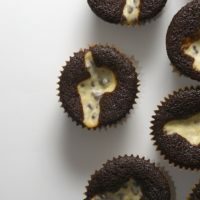 They kind of look like little coffee cake bites…maybe good for easter brunch. These are so original, and I really want to try them out!! 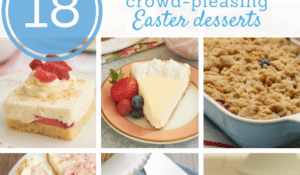 They look delish, Jen, and I can’t believe the recipe calls for only 5 ingredients – I have got to bake these. Elle, go for it! Hope you like them. Julie, these would be great for an Easter brunch. Good idea! Deborah, let me know what you think if you try them. Patricia, they’re so amazingly simple. Hope you like them! Any recipe with “pecan pie” in it has to be great. This one fits the bill, deliciously. Got them baking in the oven right now. I couldn’t resist, they look so yummy. My husband loves pecan pie and I just know he’s going to love them. Those pics are amazing and if they really taste like pecan pie, I know of quite a few people who would love them! Cupcakes that taste like pecan pie! I will have to try these. Susan, I agree! I do love pecan pie. Rain, I hope you and your husband liked them! Brilynn, they really do taste like pecan pie. I still don’t quite understand it. Kevin, let me know what you think if you try them. 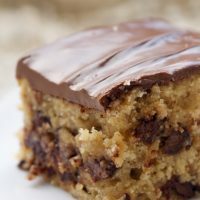 i tried baking these last night and they ended up not really tasting like pecan pie =( i also threw in a couple of chocolate chips in half of the batter, but found that the chocolate overwhelmed the wee bit of pecan pie flavor the ones with out chocolate had. i think next time i’d also add a touch of vanilla. I’ve always liked the flavor of pecan pie but I can’t hack that layer of corn syrup goo. These muffins could be the answer! 10 1/2” or 11” pie pan. They are thin and chewy and they are wonderful. You can find them on eBay and sometimes at Thrift Stores. They must not make them anymore. Mine are Pyrex and are clear glass. As for the corn syrup, I Googled it, it is a completely different type of corn syrup than high fruitose corn syrup and isn’t bad for you. Melody, I’m sorry you had trouble with these! Tracy, my cousin Jenna says the same thing about pecan pie. Let me know what you think if you make them! I had the same results as Melody, mine didn’t taste like pecan pie either. My husband agreed with me but went on to eat several of them so he seems to think they’re OK.
My husband loves pecan pie….I will give these a try. Beautiful photos as always. I’ll have to save this recipe! Peabody, I hope you and your husband like them! Yum! I love the chocolate drizzled over them. wow—these are amazing! You’re right you just can’t eat one! I’ve made 4 batches since I’ve made them—in 4 days!!! Thanks for sharing! Wow, Steph! Sounds like you really do like them. Thanks! Oh my goodness…. pecan pie?!? 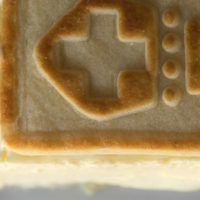 I might have to try this with a bourbon cream cheese frosting recipe that I’ve been meaning to make…. yummmmmmmmmm! 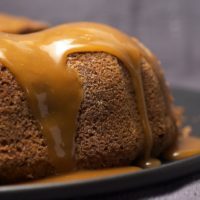 caracakes – bourbon cream cheese frosting? Seriously? That sounds absolutely delicious! I’ll be on the lookout for that on your blog. I have been thinking about making miniature pecan pie, but I am going to try these instead. My first visit to your site I have enjoyed myself. Thanks………. Thank, Kim! I hope you like the cupcakes. I made these (in no time flat!) in mini bundt cake form. The way they baked made them come out with a caramelized “Crust” and tender chewy “filling”. Tasted familiarly like pecan pie. Yumminess! I gave extras to my friends who proclaimed that I should open a bakery. Thank you for a simple and delicious dessert! 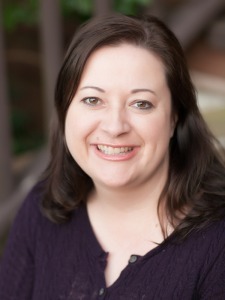 Kelly, I’m so glad you liked them! I like the idea of baking them in mini bundt pans. Cute! Thanks. I might try these today. 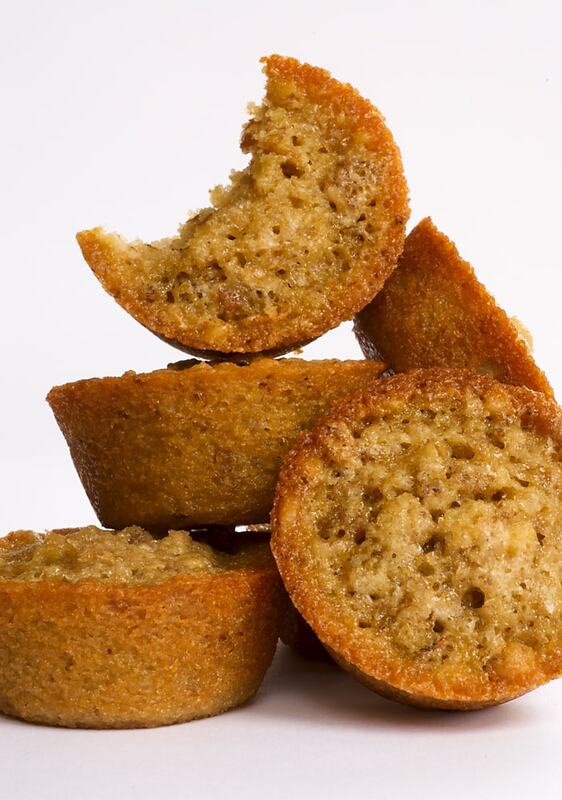 I just posted this great find on our food blog as well……..they are dreamy, taste treats. These are really out of this world. I can’t believe they taste exactly like little pecan pies. Thanks for sharing the recipe!! 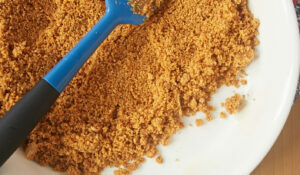 what kind of brown sugar do you use – light or dark brown? Ona, I used light brown sugar. It’s just a preference thing. Either would work. They are a little tamer than pecan pie, but still pretty sweet. Wow! These look perfect for a Thanksgiving dessert! I’m thinking about trying them with a cream cheese icing instead of the chocolate though. How do you think that would work out? Missy, that sounds heavenly to me! I love pecan pie also. I am going to try this recipe. Thank you. What if you use butter with salt in it? There’s no salt in the recipe to cut back, so they’ll just be saltier. If your pecans are unsalted, then it may not make much difference. These sound amazing…can’t wait to try them! I think I will top them with a Bourbon-Brown Sugar Swiss Meringue. Thanks for the recipe. promised my husband a pecan pie for thanksgiving but too lazy to make the crust so I found this recipe! Oh my gosh , they are so yummy! Tastes just like pecan pie! Was going to make a cream cheese frosting for the top but they don’t need any extras, terrific just the way they are! Husbands happy!! How long to bake if I were to use, a regular size muffin pans. Hi, Sese. I’ve not made these in standard-size muffin pans, but I would guess 22 to 26 minutes. You can check for doneness with a pick inserted into the center. It should come out clean. I made these as a mini cupcake using liners. Once cooled, I sprinkled some confectioners’ sugar on top…A new addition to my xmas cookie tin and a huge hit. Much, much easier to pack in the tin than previous years’ pecan pie squares. All the flavor, a lot less hassle. Plus, I added some vanilla bean powder and WOW! A keeper! So glad you liked them, Ellen! Their simplicity and packaging makes them a great choice for filling lots of cookie tins! These are my new favorite dessert! I’ve been having them after lunch with Greek yogurt, which cuts the sweetness. Mine stuck badly to my mini cupcake tin so next time I might use paper liners. Nonetheless, these taste just like pecan pie, have a wonderful crispy crust, are chewy inside, and have a nutty crunch. I will be making these a lot! Could your recipes actually get any better? These a super easy, super tasty and super addictive! I made these for the secretary of the school where I work, because she’s been helping me out a lot with reports and things. She ate 5 in the span of 10 minutes! She took the rest of them home and her son polished them off. I love the chewiness from the brown sugar! Yay! I love these little guys. So easy to make and so, so good! I made these in 1/2 cup muffin moulds and baked them for 17 minutes. On the first day, I was wishing I’d only had them in for 15–they were yummy but drier and cakeier than I was expecting. However, over the next couple of days they kept getting more moist and chewy. They were still good after a week in the freezer. I’ll definitely be trying this one again! I love pecan pies … I will be trying these soon. I want to drizzle the chocolate on them but I’m not sure what kind of chocolate to use … What do you recommend. I love your blog. Thank you for all the time you put into it and thank you for all the recipes, ideas and tips you share!!!! Thank you so much, Virginia! Store-bought chocolate syrup is the easiest way to do that. 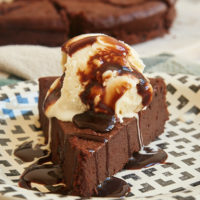 You can also just melt some chocolate with a little bit of butter (about 1 teaspoon for every 1/2 cup of chocolate) for a simple homemade chocolate drizzle. I have been making these beauties for a few years. They are so easy to make and are so delicious. Everyone always loves them – great by themselves but also a perfect snack with tea or coffee. I do add about a teaspoon or two of grated lemon zest. I add lemon to almost everything I bake. I’m so glad you like them! I really like the idea of lemon zest added to these. I made the pecan pie muffins. I added chocolate chips. They are delicious. Love the addition of chocolate chips!